Have you grown tired of video slots, spinning reels and the monotony of online slot games? For our excitement, Tesla is here to stay. 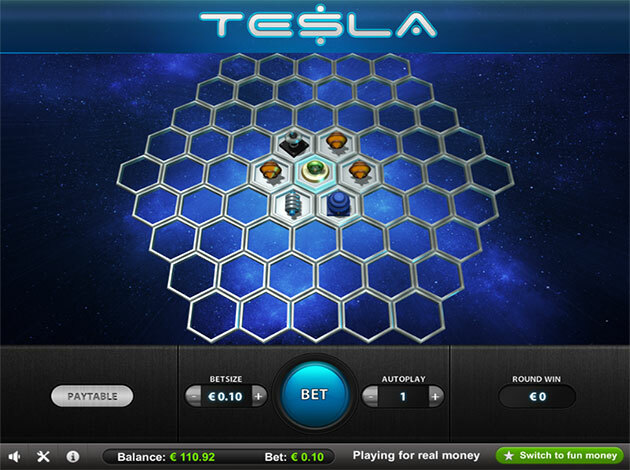 Tesla is a completely new kind of a video slot. It is a dynamic hexagon structure, yet simple and classical style game in terms of winnings and playability. The game starts when middle cell of a hexagonal board appears and electrifies. Then any identical symbols touching an electrified symbol also become electrified. So the game objective of Tesla is to reveal connected groups of identical symbols. There are seven normal symbols in the game. All are electronic components of some kind, naturally. Payouts vary between symbols and the larger the group the larger the payout. There are also multiplying wilds that copy themselves into up to 3 additional cells to boost your winnings. Select a bet size by clicking – and + buttons next to “BETSIZE” display. Click “BET” button to begin. To use autoplay, select a desired number of rounds by clicking – and + buttons next to “AUTOPLAY” display, and then click “BET” button. You can interrupt autoplay at any time by clicking “STOP” button. The slot starts when the middle cell of the board is revealed and electrified. Any identical symbols touching an electrified symbol also become electrified. Any symbols in cells next to electrified symbols are revealed. If there are visible, continuous groups of at least three identical symbols, they become electrified too. When a wild symbol is revealed, it copies itself into up to three adjacent cells, after which all wilds become copies of symbols in a group that found them. Wild symbols never copy themselves onto already electrified cells, other hidden wilds or cells that already hold or hide the symbol that they would become. At the end of the game, a player is paid prizes for all electrified groups of five or more symbols. Groups of over 16 symbols pay the listed top prize. All payouts are multiplied by betsize, and are already displayed so in paytable view. Prizes from different groups are added together. Your winnings are displayed in “ROUND WIN” display. The symbols in each cell are picked randomly and indepently from a weighted list of symbols. Probabilities in each spot are equal except for the central cell, which cannot hold a wild symbol. Tesla has absolutely gorgeous high-quality 3D-graphics. Realistic looking electric current runs through matching symbols. Meanwhile, the hexagonal game board appears to float through the outer space. The soundtrack is pretty catchy, especially for an online casino game! Enjoy the celestial, trance-like music playing in the background. You can turn music off from the speaker icon at the left bottom of the display. Right next to the speaker icon there are wrench and screwdriver, this is where you can adjust all the settings of the game. You can change graphics quality, zoom effects, flicker effects, background sounds, sound effects, display into screen and game replays. Named after physicist and electrical engineer, Nikola Tesla, this online slot will be an electrifying experience for all, and Videoslots.com wishes you the best of luck in the game!